Ivan Sergeyevich Turgenev (Russian: Ива́н Серге́евич Турге́нев IPA: (November 9 [O.S. October 28] 1818 – September 3 [O.S. August 22] 1883) was a major Russian novelist and playwright. His novel Fathers and Sons is regarded as a major work of 19th-century fiction. Turgenev was born into a landed and wealthy family in Oryol, Russia, on October 28, 1818. His father Sergei Nikolaevich Turgenev, a colonel in the Imperial Russian cavalry, died when he was sixteen, leaving Turgenev and his brother Nicholas to be brought up by their abusive mother, Varvara Petrovna Lutovinova. After the standard schooling for a child of a gentleman's family, Turgenev studied for one year at the University of Moscow and then moved to the University of St Petersburg, focusing on the classics, Russian literature and philology. He was sent in 1838 to the University of Berlin to study philosophy (particularly Hegel) and history. Turgenev was impressed with German Central-European society, and returned home a "Westernizer", as opposed to a "Slavophile", believing that Russia could best improve itself by imitating the West. Like many of his educated contemporaries, he was particularly opposed to serfdom. A family serf read to him verses from the Rossiad of Kheraskov, a celebrated poet of the eighteenth century. Turgenev's early attempts in literature, poems, and sketches had indications of genius and were favorably spoken of by Belinsky, then the leading Russian literary critic. 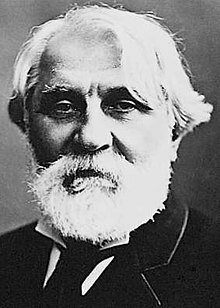 During the latter part of his life, Turgenev did not reside much in Russia; he lived either at Baden-Baden or Paris, often in proximity to the family of the celebrated singer Pauline Garcia-Viardot, with whom he had a life-long affair. Turgenev never married, although he had a daughter with one of his family's serfs. Tall and broad, Turgenev's personality was timid, restrained and soft-spoken. His closest literary friend was Gustave Flaubert. His relations with Leo Tolstoy and Fyodor Dostoevsky were often strained, as the two were slavophiles, opposing Turgenev in this respect. His rocky friendship with Tolstoy in 1861 wrought such animosity that Tolstoy challenged Turgenev to a duel, afterwards apologizing. The two did not speak for 17 years. Dostoevsky would parody Turgenev in his 1872 novel, Demons, through the character of the novelist, Karamazinov. Dostoevsky's 1880 famous speech at the unveiling of the Pushkin monument brought about his reconciliation with Turgenev. Turgenev occasionally visited England, and in 1879 the degree of D.C.L. was conferred upon him by the University of Oxford. He died at Bougival, near Paris, on 4 September 1883. His famous deathbed plea with his old enemy Tolstoy rang: "My friend, return to literature!". Tolstoy after this wrote such works as The Death of Ivan Ilych and The Kreutzer Sonata. Turgenev's brain was weighed in 1883 at an incredible 2021 grams. Turgenev first made his name with A Sportsman's Sketches (Записки охотника), also known as Sketches From a Hunter's Album or Notes of a Hunter. Based on the author's own observations while hunting birds and hares in his mother's estate of Spasskoye, the work appeared in a collected form in 1852. In 1852, between Turgenev's Sketches and his first important novels, he wrote his (now notorious) obituary to his idol Gogol in the Saint Petersburg Gazette. The key passage reads: "Gogol is dead!...what Russian heart is not shaken by those three words?...He is gone, that man whom we now have the right, the bitter right given to us by death, to call great." The censor of St. Petersburg did not approve of this idolatry and banned its publication, but Turgenev managed to fool the Moscow censor into printing it. These underhanded tactics landed the young writer in prison for a month, and he was forced into exile to his estate for nearly two years. His next work was A Nest of Nobles (Дворянское гнездо)in 1859, and was followed the next year by On the Eve (Накануне), a tale which contains one of his most memorable (and beautiful) female characters, Elena. His On the Eve portrayed the Bulgarian revolutionary Dmitri. In 1862 Fathers and Sons (Отцы и дети), his most enduring work, was published. In it the author would famously describe the revolutionary doctrines then beginning to spread in Russia. His lead character Basarov is heralded as a fine character of the 19th century novel. Russian critics of the day did not take to Fathers and Sons. The stinging criticism, especially from younger radicals, disappointed Turgenev and he wrote very little in the years following Fathers and Sons. His next novel, Smoke (Дым), was published in 1867 and was received less than enthusiastically in his native country. His last work of any length, Virgin Soil (Новь), was published in 1877. Aside from his longer stories, shorter stories, such as Torrents of Spring (Вешние воды), First Love, and Asya were written around this time. These were later collected into three volumes. His last works were Poetry in Prose and Clara Milich, which appeared in the European Messenger. Turgenev is considered one of the great Victorian novelists, ranked with Thackeray, Hawthorne, and Henry James, though his style was much different from these American and British writers. Turgenev has often been compared to his Russian contemporaries, Leo Tolstoy and Feodor Dostoevsky, who wrote around the same time and on similiar issues. Lee Hoiby an American composer and his opera based upon "A Month in the Country"